Though it could be argued that Apple's popular and widely used iTunes media player was responsible for the growth and explosion of podcasting, I would argue that iTunes is not the best way to manage and listen to your podcast subscriptions—if you're a iPhone, iPad, or iPod Touch user. Instead, you will find that a $1.99 mobile app called Instacast (iTunes App Store link) is a much better method. Below, a short video introduction to Instacast, plus a written breakdown of its features. With Instacast, you can subscribe to and download audio and video podcasts to your iOS mobile device for easy listening anywhere, and without having to link to iTunes to search for and find new episodes. In other words, you're not stuck listening to podcasts on your home computer via iTunes. Instacast updates your subscriptions each time you open it, or you can simply pull down on the home page and Instacast will refresh your subscriptions and download new episodes. In the latest version, you can now listen to a podcast in the background, which you means you can navigate away from the app and browse the internet on your device. The app also includes a 2x playback, bi-directional skipping, which means when you tap the forward button, it skips ahead about 90 seconds. I find this convenient for skipping over intros or wasted chatter in many podcasts. Another useful listening feature is that it will continue where you left off in an episode. A little icon for each episode indicates how much of the podcast has been played. 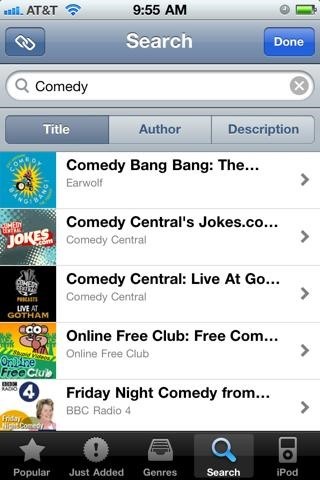 You can search podcasts in Instacast by subject, genre, popularity, and specific podcast feeds. 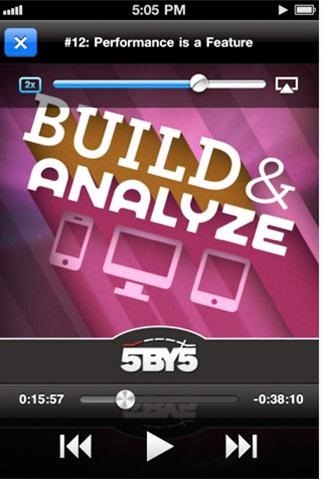 With Instacast's search feature, I have discovered numerous programs I had never heard of. And unlike searching for podcasts in iTunes on my iPhone, the browser in Instacast actually shows the notes and descriptions (if provided) for each episode. You can even search and browse podcasts while listening to an existing one. 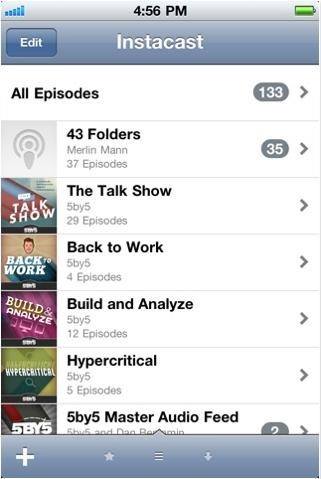 Instacast accesses a directory of 11,000 podcasts and episode previews on both iTunes and other streaming sources. When you subscribe to podcasts in iTunes, they download to your internal or external hard drive. If you subscribe to several dozen podcasts, the more episodes you download, the more memory space is taken up on your drives. Sure, you can arrange to have podcasts deleted from your iTunes library after they are listened to, but until you get around to hearing them, they are taking up precious space. With Instacast, podcasts are wirelessly streamed, over WiFi and 3G, to your device for most of the listening you do, which means it takes up hardly any space on your device. However, to save on 3G bandwidth on your iPhone or iPad, it's a good idea to preload (tap the download button at the bottom of an episode, and tap again to delete the download version) individual episodes for when you don't have home or free WiFi access. Podcasts are like television shows, the list of episodes get longer and longer over time. On the Instacast home page, you can not only have as many subscriptions as you like, but you can manually arrange them in the order you like as well—thus keeping say your favorite podcasts near the top of the list. You can also star individual episodes, as well access all new episodes on a single page. In addition, you can batch mark all episodes as "listened to". And finally, you can share links to episodes via email, Twitter and Facebook. If you're an avid podcast listener with an Apple mobile device, you owe it to yourself to buy Instacast.